As everyone knows, the Mayan calendar (and so too the world) ends on December 21, 2012. Rather than just get a new calendar as we all do every year, we're just going to let this happen I suppose. 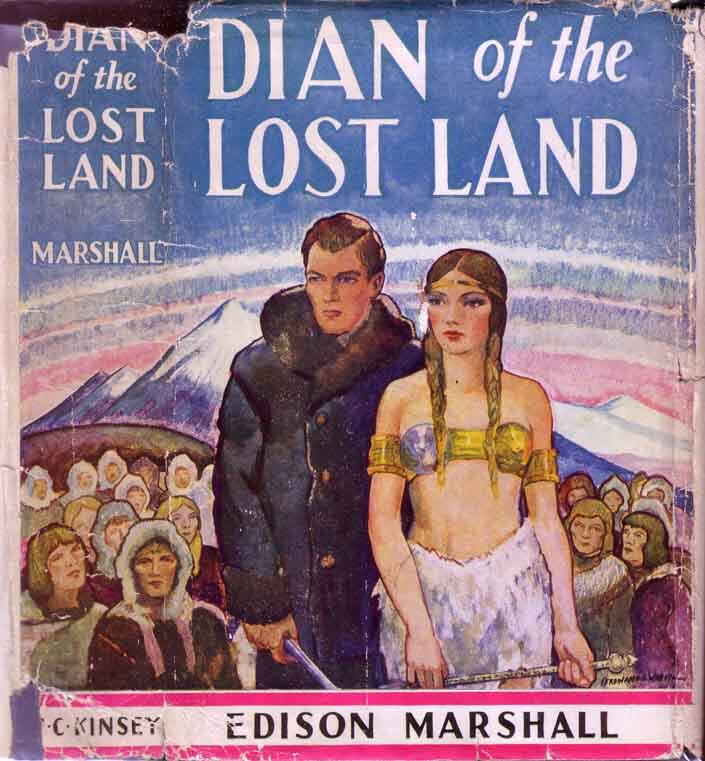 Before it does, though, you might want to read a little about Mayas and the end of the world, and what better place than in the magazine Weird Tales? You could of course also read "The Call of Cthulhu" by H.P. Lovecraft, and though the world doesn't end in that story, it's only because the stars aren't right. Finally, here's a story I have read, and though humanity doesn't meet its end in this one either, we live on only because people from Venus save our bacon: "When the Green Star Waned" by Nictzin Dyalhis. 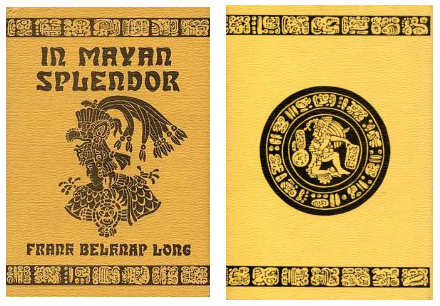 In Mayan Splendor is a collection of poems by Frank Belknap Long (1901-1994), published by Arkham House in 1977. The back cover shows the familiar circular motif of Mayan art. If a circle has no end, why shouldn't the calendar as well? 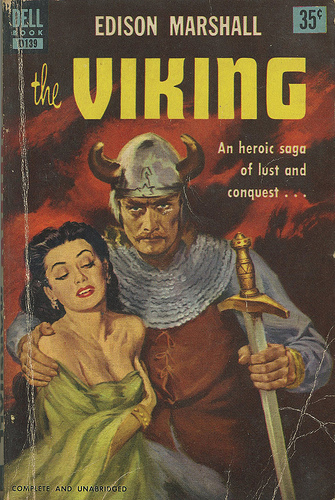 Of all the covers I have looked at this evening, this one seems most appropriate to the subject at hand. 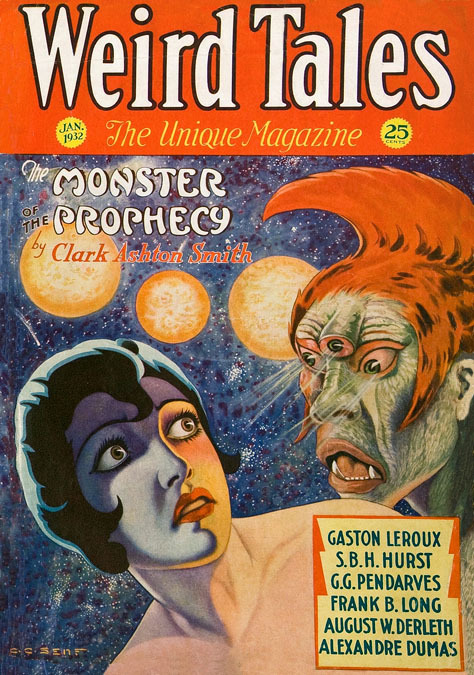 The cover story is "The Monster of the Prophecy" by Clark Ashton Smith. 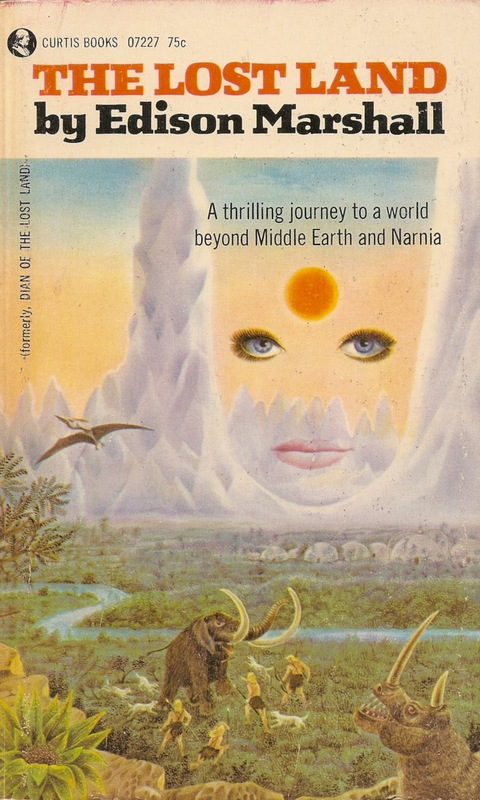 The cover art is by C.C. Senf. I think this is one of his better covers, not only in its design but also in its execution. By the time that four-issue revival of Weird Tales had been published in 1973-1974, two of its artists--Andrew Brosnatch and Virgil Finlay--had passed away. 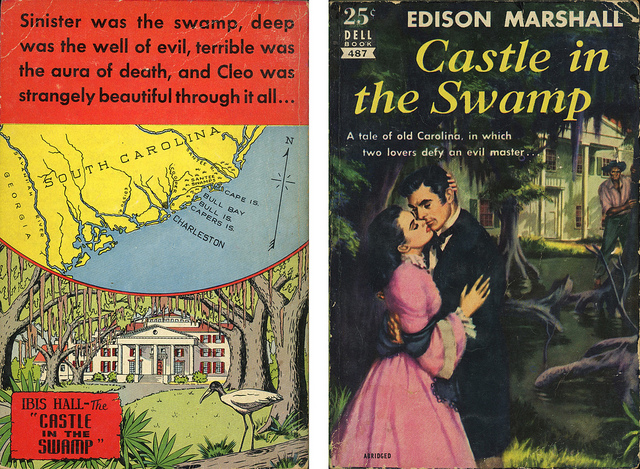 Jack L. Thurston's art was almost certainly used without his knowledge or permission. Bill Edwards and Don Rico were both well-established, professional artists. 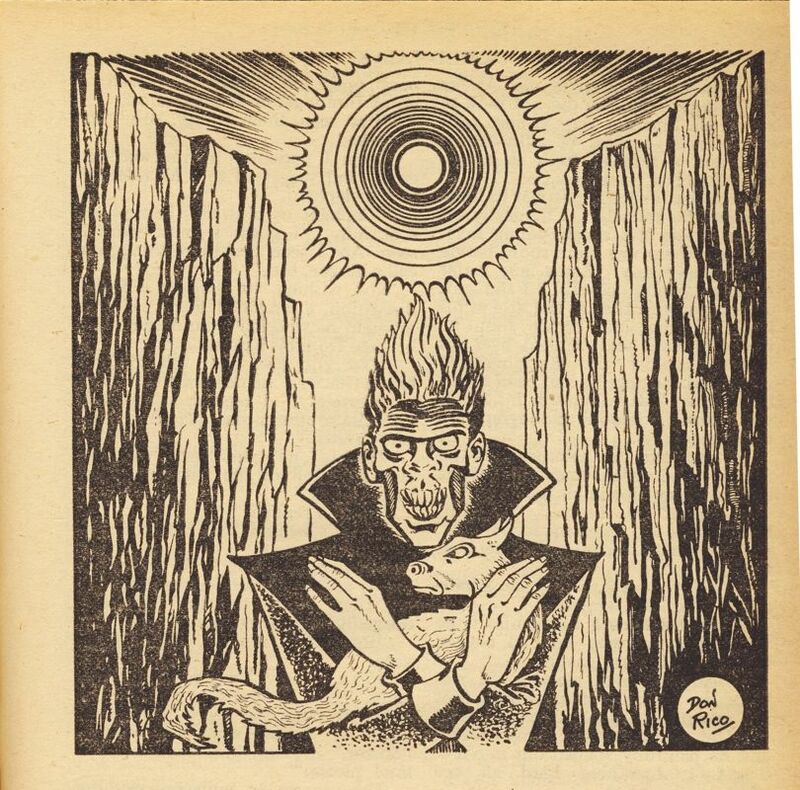 Their art seems to have been created specifically for the 1970s Weird Tales. 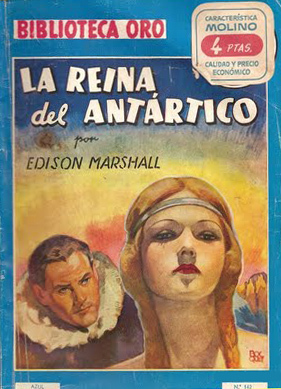 Both were based in southern California, which is where Weird Tales was published, and while Edwards was busy with acting and other activities, Don Rico had begun a teaching career at UCLA. He began with courses in the history of comic books. By 1976, he was making plans to teach young students how to draw them. The reason I bring all this up is that it leads to a line of conjecture. I have been unable to find anything on the artist Geoffrey Sickler except for a reference to a man by that name who graduated from Edison High School in Huntington Beach, California, in 1971. Gary van der Steur, who created the cover of the second issue of Weird Tales, graduated from the California Institute of the Arts in 1971. (The school absorbed the Chouinard Art Institute in 1969; Mr. van der Steur would have matriculated at one school and finished with another.) Much of the unsigned art in Weird Tales from 1973-1974 looks like student work. So my question is, did Sam Moskowitz or his representative approach students or recent graduates of the California Institute of the Arts or other local art schools and ask them to illustrate Weird Tales? Was Don Rico, who was just beginning his teaching career, somehow involved? Donato Francisco Rico II was born of Italian parents in Rochester, New York, on September 26, 1912. As a child artist, he was something of a prodigy. At age twelve, Rico earned a scholarship to study drawing at the University of Rochester. At fifteen, he learned to make woodcuts under Henry J. Glintenkamp (1887-1946), a graphic artist and cartoonist who had contributed to the radical journal The Masses and who had exhibited at the famed Armory Show in 1913. And at twenty-one, Rico was listed in Who's Who in American Art. During the 1930s, Rico worked for the W.P.A. Federal Art Project under the supervision of Lynd Ward (1905-1985), who some believe to have created the first American graphic novel. Rico's Depression-era prints made their way into the permanent collections of the Metropolitan Museum of Art, the Library of Congress, the New York Public Library. Then, when he was only in his mid-twenties, Don Rico became a comic book artist. Woodcuts are of course a very old form and perhaps mostly for specialized tastes. On the other hand, in the late 1930s, comic books were new, exciting, and wildly popular, and if an artist could crank out four pages a day at $7.50 per page, he might put food on the table. Moreover, the comic book industry needed artists, and so Don Rico answered the call in 1939, almost at the outset of what is now called the Golden Age of Comics. Rico drew Flick Falcon (later Flip Falcon), Blast Bennett, and the Sorceress of Zoom for Fox Publications. He also contributed to Planet Comics and Fight Comics (Fiction House) and drew Silver Streak and Daredevil for Lev Gleason. During the 1940s, Rico worked for Timely (later Atlas, later still Marvel), Fawcett, MLJ, Quality Comics, and Novelty Press. He also sang in New York nightclubs and had his own radio show upstate. 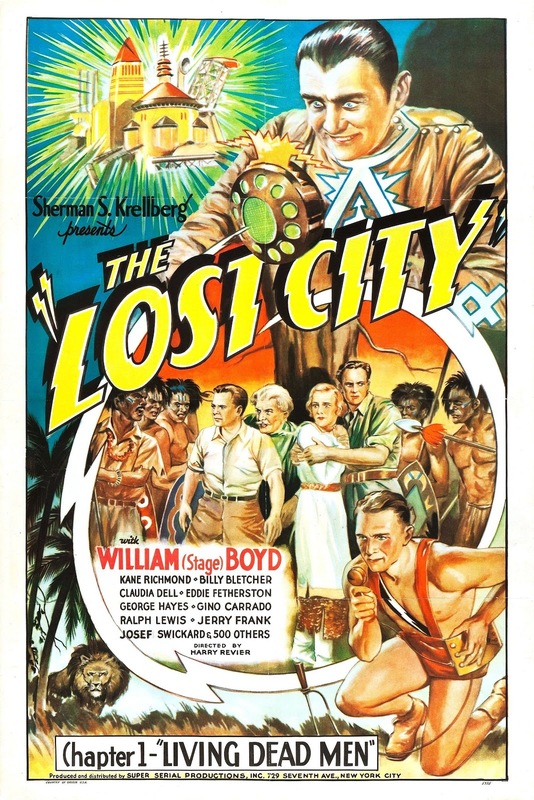 As one of the editors at Atlas (the stage between Timely and Marvel) in the 1950s, Rico, working under Stan Lee, wrote comic book scripts, and co-created Jann of the Jungle and Leopard Girl. 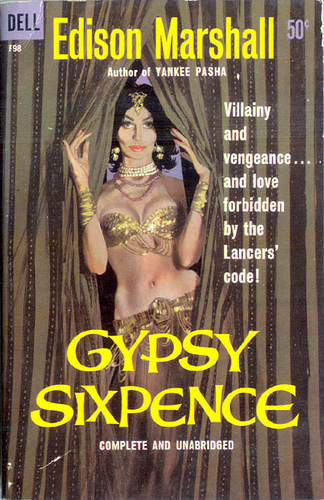 In 1958, Don Rico moved to Los Angeles and began writing paperback novels for Lancer, Paperback Library, and other publishers. 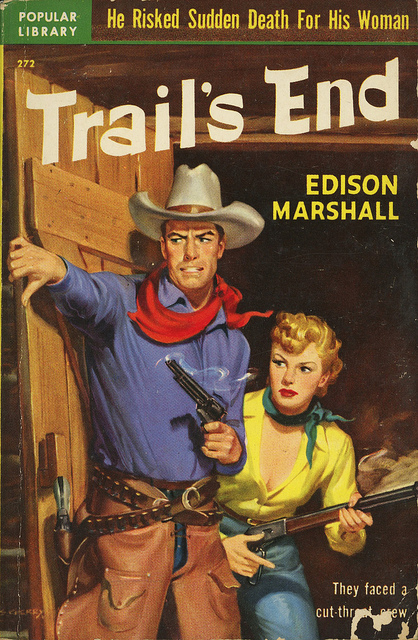 His books eventually numbered more than sixty, mostly Westerns, mysteries, and a few others with very suggestive titles. In addition, Rico wrote stories or scripts for Adam-12, Godzilla, and Jana of the Jungle, as well as for a movie called Mary, Mary, Bloody Mary (1975). 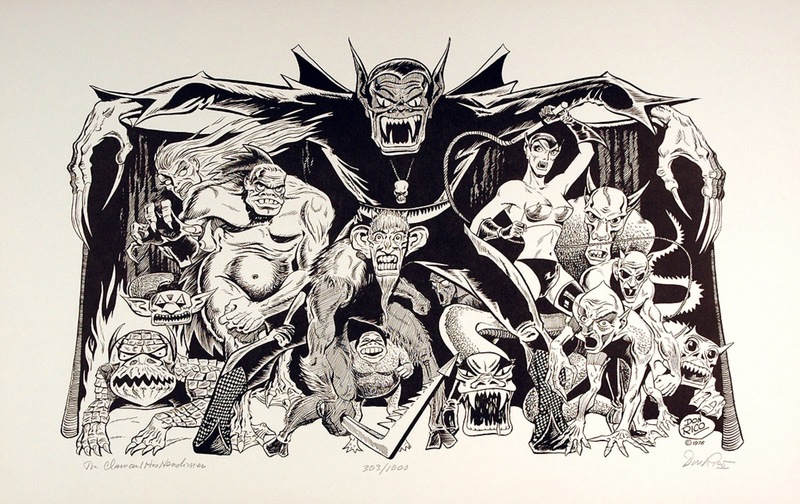 He continued with comic book work as well, and in the early 1970s provided the illustrations for almost an entire issue of Sam Moskowitz's revived Weird Tales. Not counting the cover, there are seven full-size illustrations plus one spot drawing and a decoration in Weird Tales for the Winter of 1973. Of those seven, five are the work of Don Rico. I'm not sure how he found the time to do those drawings, for Rico must have been busy with far more remunerative work. In any case, he continued writing, drawing, and teaching into the 1980s and died on March 27, 1985, in Los Angeles, California. By the way, Rico's wife was the actress Michele Hart. You can find out more about Don Rico and see some of his artwork here. Otherwise, his work is all over the Internet and you won't have any problem finding it. 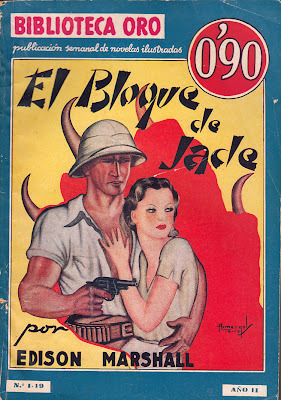 Don Rico worked in comic books for more than forty years and wrote, drew, and even created many titles and characters. Here's a print from 1975 showing a few of them. 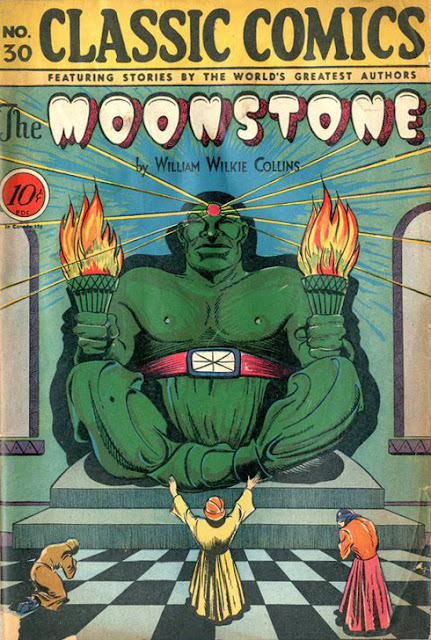 In the 1940s, Rico drew the pictures for the Classic Comics adaptation of The Moonstone by Wilkie Collins. Here's the cover, and when I first saw it, I had to admit, it looks a lot like . . . 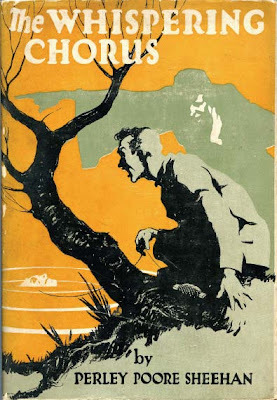 This cover by Margaret Brundage for Weird Tales, illustrating C.L. 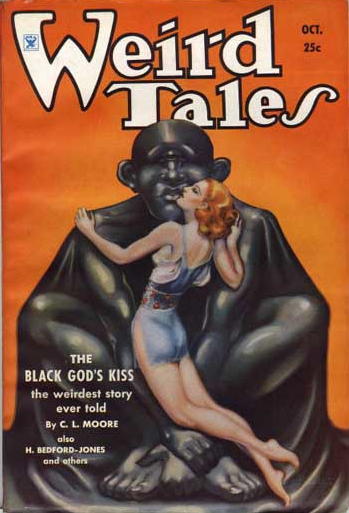 Moore's story "The Black God's Kiss." I guess there are only so many ways you can draw an idol. Many years later, Don Rico provided most of the illustrations in Weird Tales for Winter 1973. This one if for "The Splendid Apparition" by Robert W. Chambers. Note the symmetry of these four drawings taken together. Muriel Campbell Dyar was born on the day before the nation's centennial year began, on December 31, 1875, in Marietta, Ohio. Granddaughter of a professor and daughter of an oilman, she graduated from her hometown Marietta College in 1897. A 1905 directory of alumni listed her as engaged in "Literary Work" in Beverly, Ohio, a Muskingum River town north of Marietta. The 1910 census found her across the river in Waterford and living with her sister-in-law. Muriel's occupation was listed as "Writer for Magazine." That situation repeated itself ten years later when Muriel was counted this time with her brother-in-law in Downers Grove, Illinois. He was a banker, while she continued to write for magazines. By 1930, she had arrived on the West Coast and was residing with her cousin. Muriel Campbell Dyar had by then moved up to being an "authoress" of novels and stories. The Fiction Mags Index has listed Muriel C. Dyar's stories, but that list (below) is incomplete, including as it does credits only from the period 1899 to 1912. 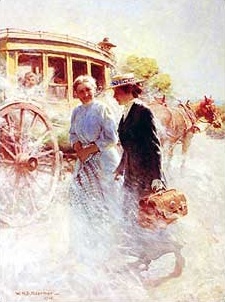 She was also the author of a book, Davie and Elizabeth, Wonderful Adventures (1908). So tantalizing was the ending of this provocatively imaginative story that hundreds of letters poured in [to The Black Cat] asking for a sequel and big red letters across the top of the March, 1900 number presented it reading: "The Woman in Red--Unmasked!" Weird Tales reprinted the story and its sequel in the first issue of its revived version in the summer of 1973. By then, Muriel Campbell Dyar had been gone a decade, having died the day before John F. Kennedy was assassinated. Her place of death was San Diego, California. Before that she had lived in El Cajon. Muriel Campbell Dyar is briefly listed in Ohio Authors and Their Books, 1796-1950 (1962), edited by William Coyle. 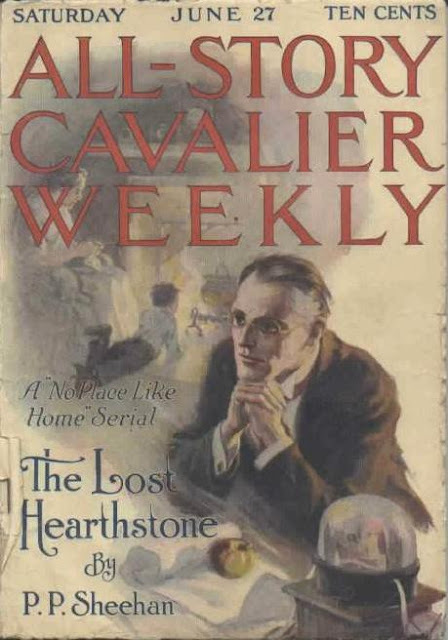 Muriel Campbell Dyar was a prolific and popular author, yet I could find only one image relating to her life and work. It's this illustration by W.H.D. 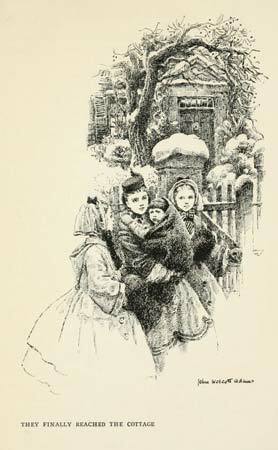 Koerner (1878-1938) for her story "Ann Eliza Weatherby's Trip to Town" from Harper's Monthly Magazine (1916). Perley Poore Sheehan was born on June 11, 1875, in Cincinnati, Ohio. As a young man, he worked as a newspaper reporter in Hamilton, Ohio, before setting off for Union College in Schenectady, New York, with fifty dollars in his pocket. When he graduated in 1898 with a degree in philosophy, he still had his fifty dollars. As the New York Times said of him, "Mr. Sheehan considered faith a substitute for cash." After his graduation, Sheehan worked on newspapers in New York. Having saved a little money, he decided to see a bit of the world. Starting with Cuba, he made his way to Spain, then to France. Sheehan arrived in Paris without knowing the language and with only ten dollars to his name. Nonetheless, within five years he had become editor of the Paris Herald, the Paris edition of the New York Herald. Sheehan held that post from 1905 to 1907. He was also a correspondent in Paris and London. While in France, Sheehan padded his bankroll, added to his knowledge of the French language, and found himself a Gallic wife. Her name was Virginia (or Virginie) Pont and they were married on May 18, 1902, in France. Perley Poore Sheehan returned to the land of his birth in 1908. It didn't take him long to begin placing stories in American magazines. The Fiction Mags Index lists his many credits between 1909 and 1933, but I'm not sure that list is complete. His specialty was adventure, and he contributed to The Argosy, The All-Story Weekly, Thrilling Adventures, and other titles. Sheehan's continuing characters included Captain Trouble and Kwa, a Tarzan-like jungle hero. It should come as no surprise that Sheehan also contributed to Munsey's Magazine, for he served as associate editor of that publication for some time beginning in 1908. 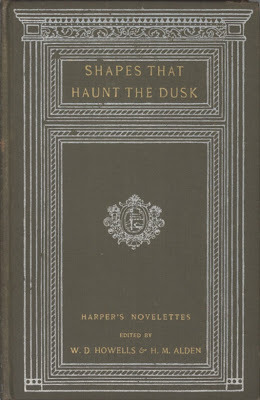 He also edited The Scrap Book under his sometime co-author, Robert H. Davis. 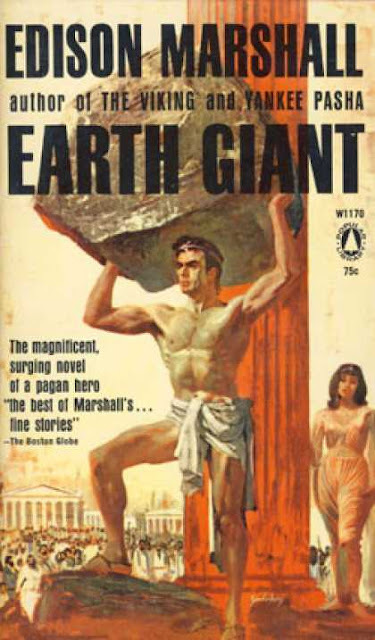 The Internet Speculative Fiction Database also lists some of Sheehan's tales, evidence that he wrote in genres other than just plain adventure. I have combined a couple of different lists to come up with the following one. These are short stories and serials only. Sheehan's other titles follow. "Kwa and the Ape People"
"The Red Road to Shamballah"
a Hollywood mythos was clearly emerging. Perley Poore Sheehan, a popular screenwriter, issued a bizarre tract called Hollywood as a World Center, which combined elements of small-town boosterism, industry braggadocio, and occult transcendentalism (known locally as "new thought"). For Sheehan, "The rise of Hollywood and its parent city, Los Angeles, has world-wide significance. It is a new and striking development in the history of civilization. . . . This flooding of population to the Southwest has its origins in the dim past. It is the culmination of ages of preparatory struggle, physical, mental and spiritual. 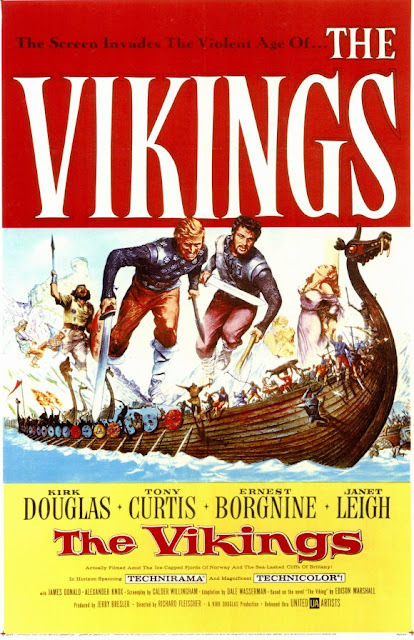 In brief, we are witnessing the last great migration of the Aryan race." Going beyond traditional American disdain for the eastern cities, Sheehan saw the birth of Hollywood as the dawn of the Aquarian age and described a New Jerusalem that would reveal to all mankind the "Universal Subconscious." If all that's true, then the web of crackpot ideas becomes a little more tangled. If you pull on a thread, you never know what might fall out. According to the Internet Movie Database, Sheehan's last movie credit while he was living was The Victim of Lust, released in 1940. By that time, the writer was residing in Sierra Madre, California, amongst a garden of castoff plants, marked by a homemade stone lych gate. He had also returned to newspaper work, writing a column for the Sierra Madre News. The Los Angeles Times noted that he had forsaken the high collars and spats of his days in Paris for an open collar and no tie. Perley Poore Sheehan wrote in an era of the great scientific romancers--Edgar Rice Burroughs, George Allan England, A. Merritt, Francis Stevens--and his work compares favorably with the best of them. 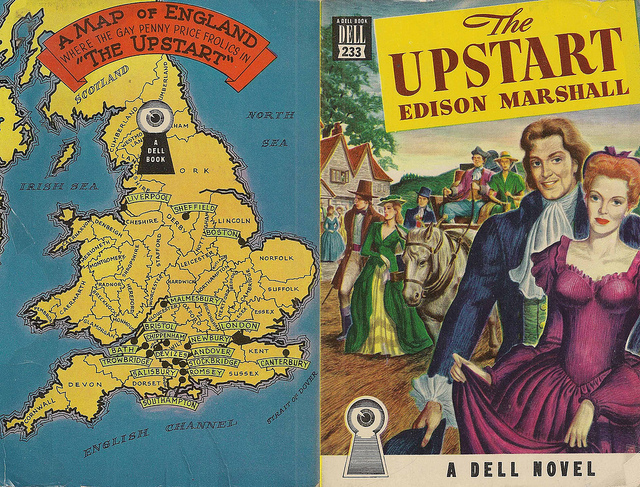 Yet, as occasionally happens to fine writers, it is rare to find his stories reprinted. ["Monsieur De Guise"] will go down on your mental list of all-time favorites. A philosophy major who made his living as a newspaper reporter and editor, Perley Poore Sheehan turned to writing fiction after ten years abroad. Here's a cover with his byline from June 27, 1914. 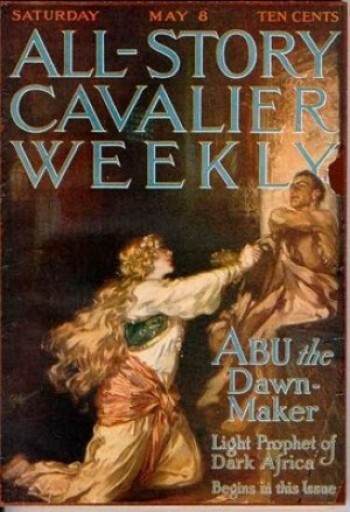 Sheehan specialized in adventure stories as in "Abu the Dawn-Maker" from All-Story Cavalier Weekly, May 8, 1915. Next came books. Here's an eerie cover from 1928, artist unknown. 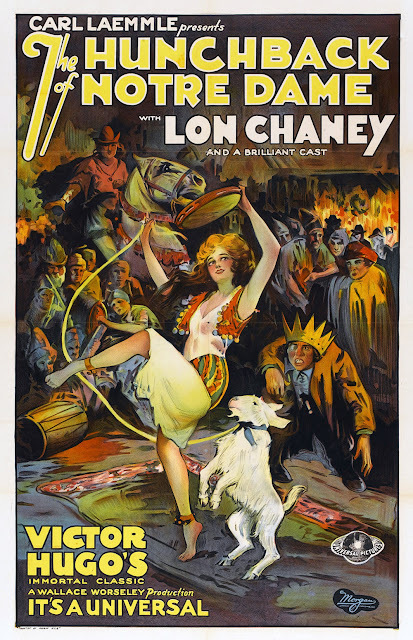 Sheehan's biggest hit as a scenarist was probably The Hunchback of Notre Dame, a star vehicle for Lon Chaney in 1923. 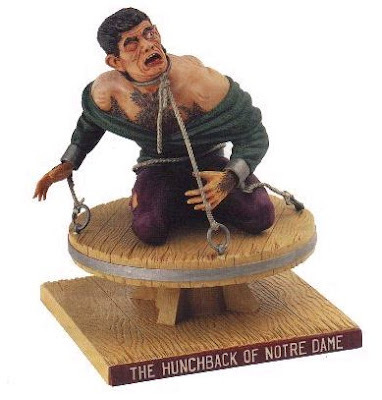 That movie was the inspiration for an Aurora model manufactured four decades later. Sheehan had dealt in lost worlds earlier in his career. 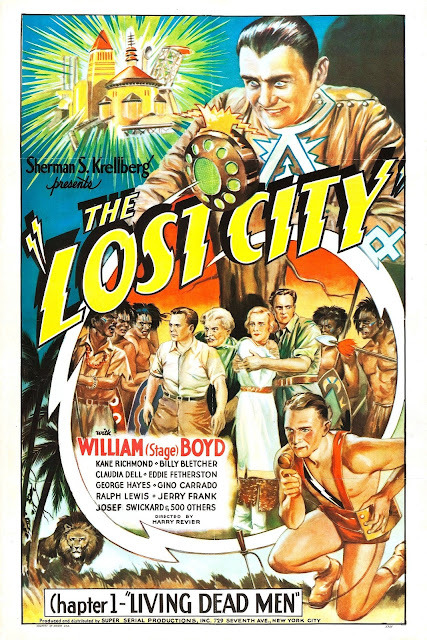 He got back into the act with his screenplay (co-written with two others) for the 1935 serial The Lost City. Kane Richmond, who received second billing here, also played during his career: The Shadow, Spy Smasher, and Brick Bradford. I have written a lot on Perley Poore Sheehan and have barely covered his credits or much on his career. I welcome corrections and additions. I hope someone can pick up the baton from here and complete a biography and bibliography. His most important sf [i.e., science fiction] is a short story about a brain transplant, "The Monster of Lake LaMetrie" (1899 The Windsor Magazine), in which the brain is human and the recipient body that of a prehistoric survival from a bottomless lake that may lead into a hollow earth. If that description doesn't make you want to read the story, I don't know what will. The Black Cat published his story "The Fate of the 'Senegambian Queen'" in 1900. Weird Tales reprinted the story in its Fall 1973 issue. An Arabian Nights kind of story, "The Seal of Solomon the Great," appeared in The Argosy in February 1901. Almost two decades later, All-Story Weekly printed his tale "The Mahoosalem Boys" (May 15, 1920). 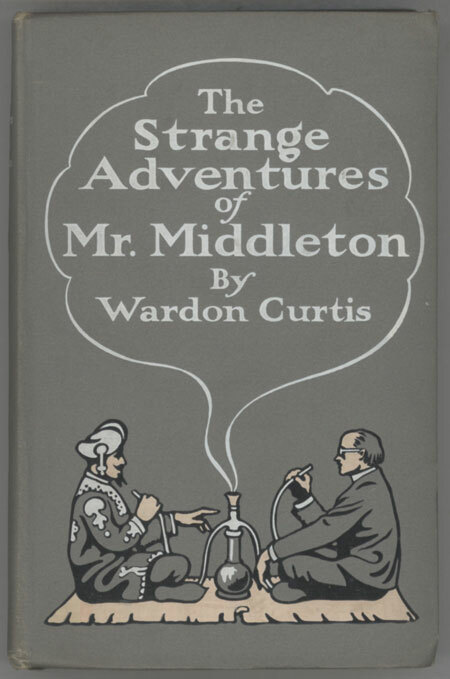 All other credits for Curtis as listed in the Internet Speculative Fiction Database are from his 1903 collection The Strange Adventures of Mr. Middleton, "a mixture of Oriental fantasy and bizarre mystery," according to The Encyclopedia of Science Fiction. Wardon Allan Curtis lived in New Hampshire late in life and died in Plymouth twelve days before his seventy-third birthday. He was buried in Green Grove Cemetery in Ashland, New Hampshire. 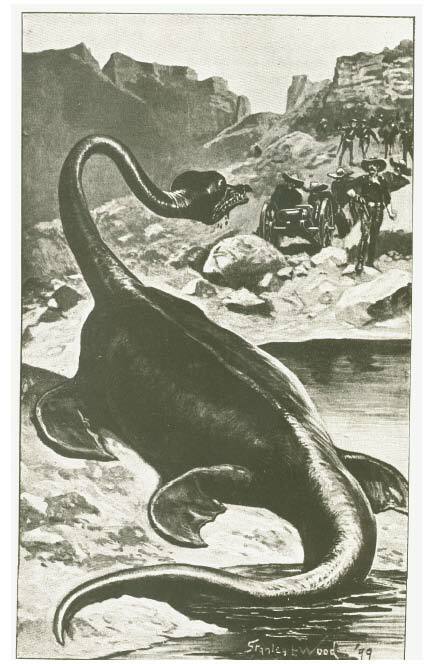 An illustration by Stanley L. Wood (1866-1928) for Wardon Allan Curtis' story "The Monster of Lake LaMetrie" from 1899, demonstrating the connection between science fiction and cryptozoology. 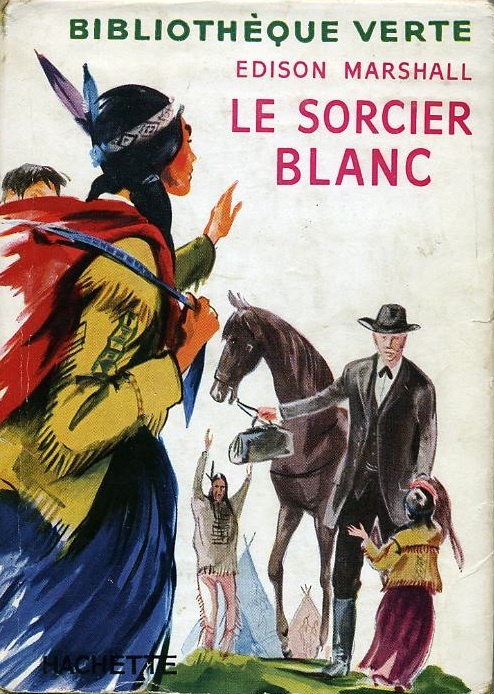 A story like this one would later have been included in that hybrid genre known as weird western. The Valley of Gwangi (1969) was a later entry in that selfsame genre. 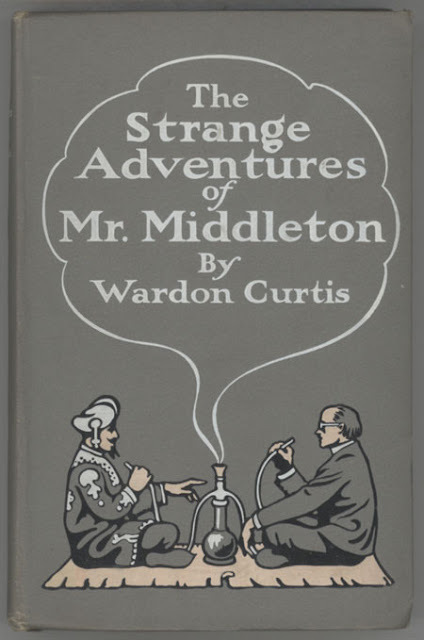 Curtis wrote a series of interrelated tales in The Strange Adventures of Mr. Middleton (1903). 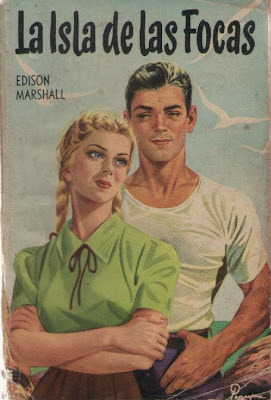 My first question upon seeing this cover illustration: "Just what are they smoking?"